Whereas most fashion brands now focus more on the holiday trend updates, the Spanish label has chosen a different path. Instead Mango decided to release a new collection for the warm season of 2014. Well, can we say that we are disappointed? Of course no. However, there is one thing that someone might be concerned about. While winter has just started, there a lot of cold days to come over before we finally meet the first rays of the March sun. Which means we have to wait for quite a long period of time in order to fully enjoy what the brand offers. Yet, the collection appears to be so adorable that it is definitely worth waiting. So take a look at the fashionable outfits and start planning for your spring wardrobe! 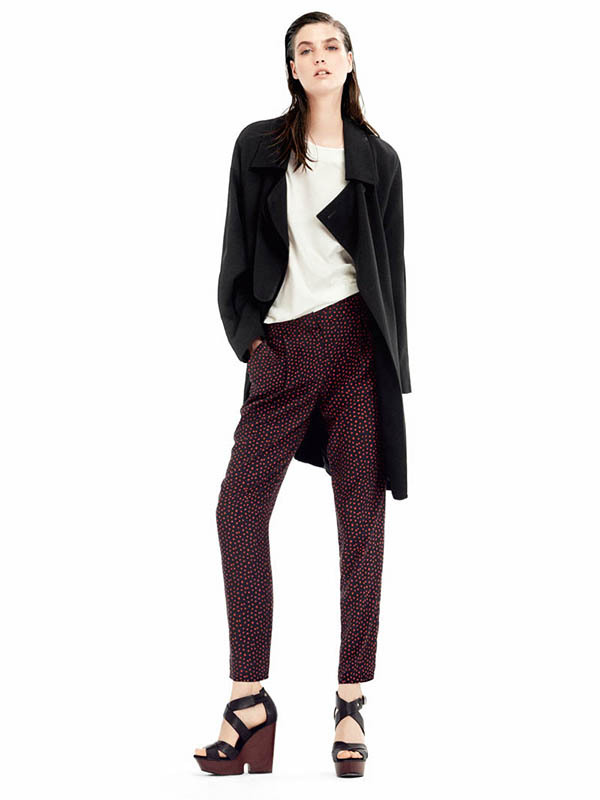 Mango offers quite a range of outfits for the coming warm seasons. The best thing about them is that they are so diverse, that you can hardly name one single style that would be applicable to the whole collection. You will spot here classy, smart casual, punk, grunge and even more! With such a variety of choices why would anyone not fall in love with this line? The French model Manon Leloup starred in the fashionable photoshoot. Mango is the brand that always knows how to make the ladies happy. Somehow the creative director manages to predict our desires and present just what we were craving. This time, it is even more than what I have expected. For example, I have been thinking about a rock shirt since the Milan Fashion Week that took place in September. I was looking through various internet shops trying to find the one that would fit me. And here it is, the white T-shirt with some meaningless slogans seems to be created especially for me. I also like the combination a lot. 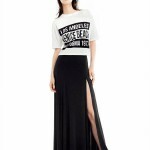 A maxi skirt in black with an impressive slit all the way to the thigh – what can be a better match for such a shirt? Another mind-blowing item is a dress. Mango has rarely impressed me in terms of providing with decent and outstanding frocks. But this time the situation has dramatically changed! I fell for this one-shoulder ruffled chiffon mini in burgundy polka-dot pattern. This dress looks so feminine and innocent, that I immediately ranked it as “mine”. The model combined it with black flats, but I think we can go further and opt for high heels or even ankle booties. The more out of the way, the better it is. Since in such a case, there is room for some critical and creative thinking. 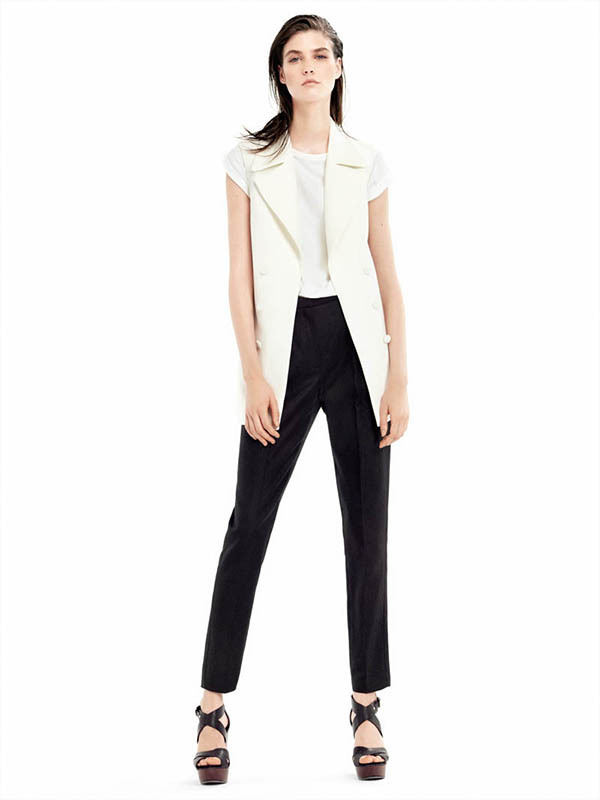 Mango Spring/Summer 2014 Collection is incredibly hard to resist. And here pops up a very reasonable question: Why would anyone torture herself on that? We all know, that Mango is quite an affordable brand. You can be sure that you won’t happen to bump into crazy prices, so there is no reason to keep yourself away from this shop. Plus, the collection will be released no until spring, so you have a lot of time to prepare the budget for great purchases. And even if the situation is really horrible, and you barely manage to meet the ends, no worries. Luckily, the Spanish brand, just like all the others, has a tradition to hold seasonal sales. This is the absolute goldfish for any fashionista. And who cares, that this will be a delayed shopping tour?